September 2018, in a small countryside in Sarthe, west of France (300 inhabitants). To answer the call to support financially and materially the struggle against Bure nuclear trash (in Bure, the french State wants to build a giant center to bury nuclear waste), we decide to organize a support day where we live. On the program: conference, exchange time on the current struggle situation, food and concerts. On the event day, the first persons arrive early afternoon, by car, bike, or by foot from the village center. (It is important to note that the event place is at the end of a 250m pathway bordered by a field on one side, and a tree hedge on the other side). Around 3 p.m., one of the participants who arrived by foot on the pathway tells us that there is an unidentified device on the ground in the grass. An organizer decides to come with her to check what it is. The device is brought back and analyzed. It is a remote surveillance camera of model BOLYGUARD MG983G. A team is put together to go check if other devices are hidden. *Bingo*, two other are found on the same pathway. One is attached at a height of about 80cm in a bush, of the same model as the first one, and the other at about 1m20 on a tree trunk. This one looks like a strange rectangular casing, but is in fact a remote surveillance camera, this time of model RECONYX HYPERFIRE SM750. The devices were placed on the same day very early in the morning (between 3:30 a.m. and 4 a.m.). The three devices are capable of night vision, two of them were configured to take pictures and one to record video+sound (it would trigger for about 10 seconds). Their placements allowed to take pictures of the front and back license plates, and also of people following the pathway by foot. One of them was useless because of leaves in its field of vision (or rather because of the cops botched job?). The SIM cards allowed sending in real-time all the SD cards data. 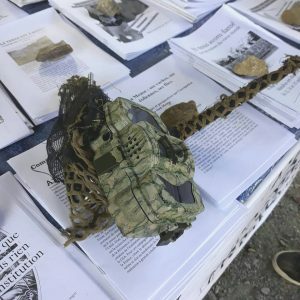 The recently launched inquiry for “criminal conspiracy” against activists of the anti-CIGEO struggle (Cigéo would be the name of the planned nuclear waste burying center) was probably the reason for the placing of these devices. During the search for the devices, it would have been appropriate to hide our faces and identifiable parts of our bodies (tattoos, piercings…), or even to not communicate orally between us but use a sign language instead. We imagine the RG (cops from the French internal intelligence services) acted out of a legal framework and that it wasn’t possible for them to come and get back their stuff. We expected to see at least one of them during the day but no! Despite the devices being found quite early on the day, next time we will pay a lot more attention to these kind of techniques, and we hope by sharing this story that you will too!